Liberty Ale® was first brewed in 1975 to celebrate the bicentennial of Paul Revere’s historic ride. Now, as we celebrate the 40th anniversary of the historic beer that started a revolution, we’ve released a commemorative, one-time offering of Liberty Ale in 12-oz. cans. The retro can has a beautiful, yet very simple, label that wraps around the entire can. While the original illustration was lost, the artwork on the can is a scan of an original label, hand crafted by artist Jim Stitt in the mid 1970s. The understated red, white & blue design connects with the feeling of Americana that we all experience with the sunshine, outdoor BBQs, and of course, good times, that are part of annual Fourth of July celebrations. A fun fact: the eagle was inspired by a very old bank note that Anchor historian Dave Burkhart has stashed away in his impressive collection of historical items used for reference and inspiration. In creating the commemorative can, a consistent theme is sewed throughout. The artwork appeals to us as Americans in a fundamental way, reflecting our collective patriotism felt deep in our gut during the singing of the National Anthem at the ball park. Or the nostalgia we experience with old home movies or family photo albums. The magical thing about working at a brewery that’s been hand-crafting beers since 1896 is there was no need to create a “retro” label. We simply go back in time via the Anchor archive, find the original artwork, and use it. There’s minimal fuss. No need to “gussy it up” or modernize it with the latest and greatest in consumer design trends. 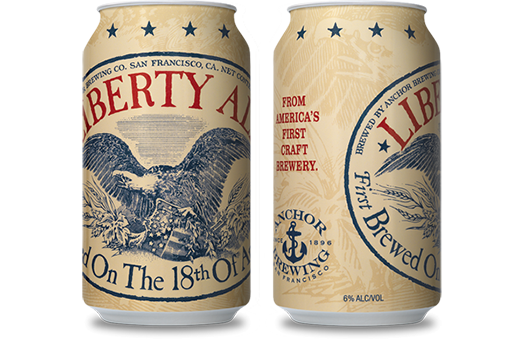 What seemed most appropriate when designing a commemorative can and carrier for Liberty Ale was to ultimately create a theme that resulted in two colors on a tan background, giving the design a look reminiscent of the Red, White & Blue of the American Flag. The concept: keep it beautiful, simple, elegant, and timeless. Being the 40th anniversary of the first brew and first label, it made sense revisit the original label for a limited-edition package available during the summer months. 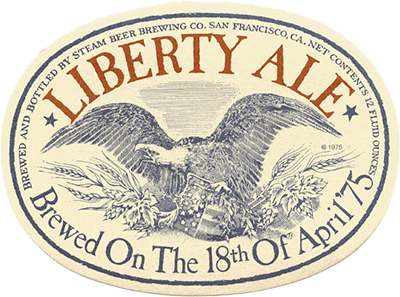 With the ever-growing number of choices in today’s craft beer landscape, it’s becoming a lesser-known fact that Liberty Ale was America’s first craft-brewed IPA. The discussion inside the brewery and in taverns, taprooms, and backyards across the country often revolves around the question, “Is Liberty Ale an American Pale Ale (APA) or an IPA?” The discussion could take hours – over beers, of course – to come to a conclusion. By the palate-wrecking standards of many of today’s hop-forward IPAs, Liberty Ale could fit more comfortably in a commanding position among American Pale Ales. However, some might suggest that it’s on the lower end of the American IPA spectrum, as Bob Brewer notes in an answer to a question for “Ask Bob Brewer.” As the first modern American single-hop and dry-hopped ale, exclusively using the Cascade hop, Liberty Ale’s distinctive hop bouquet, champagne-like bubbles, and well-balanced character are a perfect complement to a warm summer day no matter which classification you choose. A recent conversation with Anchor historian Dave Burkhart left me with an insightful comment on that subject. Dave said that every single person has a different palate and a different expectation of what an IPA should look like, what the aroma should be, and the perceived bitterness. Same thing with an American Pale Ale. Each person has an ideal sensory experience in mind. So rather than placing Liberty in one specific bucket, let them enjoy a little taste, be pleasantly suspired, and summarize their own style identity for Liberty Ale. As with most things at Anchor Brewing, a background theme is always in play, whether it’s readily apparent or not. With Liberty Ale, the design on the outside of the can is a true reflection of the beer inside it. Classic, timeless, beautifully simple, yet amazingly complex. 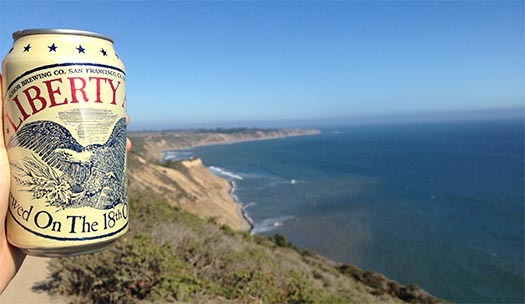 Use our Beer Finder to search for Liberty Ale cans near you, and Raise Your Anchor to American brewing tradition this Fourth of July with the beer that started a revolution! One time only? I like that can! And with the Anchor art the can is an ideal package. Hops are out of the light too… Goes far more places. Don’t stop now!